Around this time last year, I wrote a piece called “Shia LaBeouf Stars In Performance Making Fun of Himself, Is Still a Joke.” I still think it’s a funny headline, but it was mean-spirited and so was the article. Within an hour of publishing, I had a direct message from LaBeouf’s art collaborator, Luke Turner, who was offended by it. Specifically, he was offended by my assertion that Shia should stay out of the “art world.” Why would I say that? Why would I tell anyone to not make art? And for god's sake there are way worse people in the art world than Shia LaBeouf (my assertion, not his). I explained that I was asked to write that piece by my editor because it’s news, and I resented the fact that I had to write about bad work just because a celebrity was involved. That resentment fed into the piece. I’m here to say that I was wrong. project that he has been working on in collaboration with LaBeouf and Nastja Säde Rönkkö. He asked me to keep an open mind and try to see that they are working with the subject of “empathy, affect, and the humanity of the networks.” I think that’s true, and they’re actually doing a damn good job at it. The act of rolling one’s eyes was practically invented for LaBeouf’s work, especially out of context. But you can say that about all art, and when someone writes about it, they have a responsibility to discern when the eyeroll is justified. With #allmymovies, LaBeouf and his collaborators have arranged for all of the actor's films to be played in reverse chronological order at the Angelika Film Center in New York. LaBeouf is there, 24 hours a day, watching them, and anyone willing to sit through the line is welcome to join him for free. 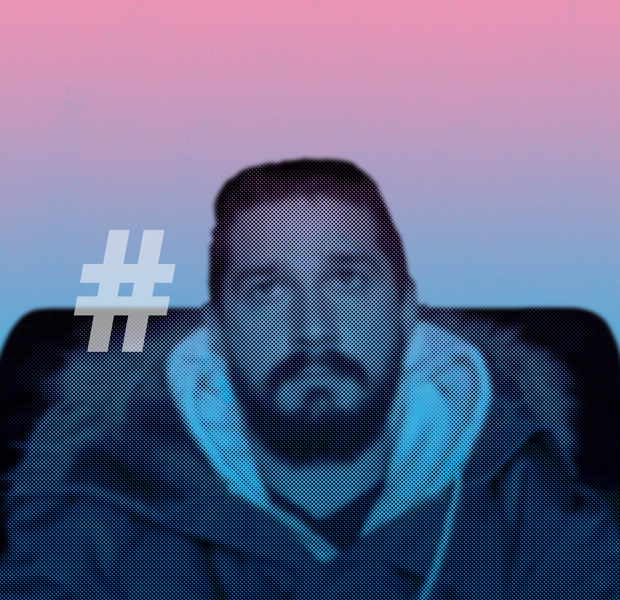 If you can’t go in person there’s a NewHive livestream from a camera pointed directly at Shia’s face. This is the 11th work the collective has done under the project title, The Campaign Book, the eighth to be titled with a hashtag, and once again it’s about “empathy, affect, and the humanity of the networks.” Especially empathy. I didn’t really hate the works before, I just hated the attention they were getting—attention that better work would never get. I saw it as stunt art by a bored actor playing artist. When he announced that he “wasn’t famous anymore” with the enigmatic quote, “when the seagulls follow the trawler, it is because they think sardines will be thrown into the sea,” I saw it as petulant hostility towards journalists and an obvious bid for publicity. But when I read reports from his performance #iamsorry, in which LaBeouf wore a bag on his head, with the words “i am not famous anymore” written on it, it actually sounded kind of moving. Several journalists went there with the intention of gleefully making fun of weirdo Shia and came away feeling shaken. Empathetic, even. Writing for the Daily Beast, Andrew Romano said, “I actually felt something real. Something strange and complex. Something like sympathy.” Like he was a human being underneath that bag. You know, “celebrities are people too,” and the smartest of them don’t complain about the difficult parts of the gig because, yes, they have a pile of money to fall back on. The worst of them are petulant (here’s looking at you Robert DeNiro). But I don’t think what LaBeouf is doing here is actually a request to be thought of as human. He wants to collaborate. That’s hard for a celebrity to accomplish because people will turn it into their own moment. They’ll insist on a selfie and will laugh at a joke that no one else is laughing at, and they’ll implicitly refuse to make a new work together because, look, a celebrity. The strategy that’s being implemented is to make space for others to turn it into their own thing while using simple gestures. “Come run with me, talk to me while I wear a heart monitor, watch one of my movies with me (it’s as weird for me as it is for you).” This is actually very clever, and it’s about as close as a celebrity can get to intimacy with the public at large. In which LaBeouf commissioned a plane to sky write #startcreating over Los Angeles and set up a Tumblr to collect the subsequent Instagram photos from the public. In which LaBeouf collaborated with 36 undergrads at Central Saint Martins in London for their 2015 degree show. He invited each student to provide a short-text introducing their work and he read the text aloud in front of a green screen. Viral bonanza ensued over an energetic “Do it!” speech. In which LaBeouf broadcast his heartbeat online for six days while attending the SXSW festival and encouraged people to talk to him and monitor how their interaction affected his heartbeat. In which LaBeouf read a love letter to Sia while presenting at the Grammys. In which LaBeouf brought a journalist into the process of the interview for Dazed, and gave an in-depth account of being assaulted during #iamsorry. In which LaBeouf invited the public to join him in running laps around the Stedelijk Museum. In which LaBeouf invited the public to join him in skipping rope. In which LaBeouf wore a bag on his head, on which was written “i am not famous anymore,” and sat inside a gallery at a table littered with items referencing his career. He invited the public to come and do or say whatever they wanted while he sat in silence. In which LaBeouf, well, ok, this one's some vague theoretical frameworks that would have to be taken one by one. It’s a manifesto, you know? sidekick to freakin' Indiana Jones) taking stock of what he’s done in reverse order before our eyes. He is doing that, extremely cringe-worthy act of “activating a space,” and he’s doing it well. I intentionally never look back at my Facebook or Twitter; it’s just too intense. Anyone else might look at it and shrug, but I remember how dumb, or loud, or selfish I was. If you’re a successful actor, you have a solid, viewable record of so many moments in life that no one will perceive the way you do. Outside of the sleep deprivation, I’m sure it’s slightly excruciating for him to watch himself grow up in reverse; to relive this moment on set, see that different person and his crush on that person, to think “Man, shouldn't have done that movie” or “People didn’t understand how awesome that was.” And then it all concludes at a time when you didn’t even make decisions for yourself. Just a kid. He is “activating the space” with “this is where I am, literally right here, and this is where I’ve been, up there, and, if you’d like, join me in reflecting on both.” On the livestream, he laughs, cries, shakes his head, shrugs and sleeps and no one really knows what’s going through his head but people love it. The reaction online has been shockingly positive. Film critic, David Ehrlich called it a work of genius, tweets from the public are almost uniformly positive, friends on Facebook have taken to the project as warmly as Bob Ross being rebroadcast on Twitch. That is to say, very warmly. That warmth is present in the lobby of the Angelika—where I’m sitting right now—and people are just incredibly happy to be taking part, even if it means waiting for hours. When someone leaves, they applaud; when Shia exits for the bathroom, they cheer. Online, people are taking screengrabs from the livestream and making all sorts of random associations. A friend of mine set up a stream of the audio from the films so that you could hear what LaBeouf hears while you watch him. At the time of writing this, there are 700 people listening, and commenters have synced up Netflix to go along with it. When all’s said and done, you can expect countless memes and remixes just like the “Just Do It” videos from the #introductions project. I don’t just think this piece is good, I genuinely love it. It’s one of the best artworks in recent memory. When I wrote negative things about LaBeouf, Turner and Rönkkö’s work, I accused it of being “look-at-me” tripe. I told him to stay out of the art world, and that was wrong. I hope he and his collaborators make lots of art. So to make it up to them, here I am apologizing in a piece that kind of says “look at me, apologizing.” Possibly, I’m just a seagull following a trawler, because I think sardines will be thrown into the sea. #IAMSORRY. I now empathize. Rhett Jones is the Culture Editor of Hopes and Fears.